We wondered the interstates and National Parks of the west in our mini van, packed full of our family of seven. Two kayaks strapped to the top, coolers stocked with survival snacking, minimalist clothing crammed in totes, and our hearts were set for adventure. Our beautiful brick home had sold and our belongings tucked away in a storage unit. We decided to hit the road in search of our new life. Doesn’t every adventure seeking family need a supportive mom? I chose to give it my all. Days of driving led us up the California coast where we borrowed my mom’s motorhome to add some square footage to our epic road tour. It was the kind of dream families talk about for years – but quickly abandon because it all feels so extreme. Only risk takers jump off the cliff of unknown variables with five children, right? We jumped - and thankfully, our kids joined in with expectant hearts and eyes wide open to where God was leading us – because He surely was! My momma pulse began beating a little faster as I worked through the change from living in a home, complete with beds, closets, doors that shut, and a kitchen table to camping in a short hallway (mercy help). How on earth would I survive, yet alone thrive in such a cramped space with so many people? Where would the baby nap so I could have a break? How would our marriage make it with zero privacy? Exactly how long would this be our transitional residence? I desperately wanted to do this well, because I knew it would matter later. Isn’t it always easier to embrace new things when something in life remains consistent? We exchanged a neighborhood of kindred souls, backyard swimming nights with friends, and normal routines in Tennessee, for atlas maps, finding local fun and discovering new geography in the Pacific Northwest. Our toddler set up his play area on the dashboard which turned out to be the perfect spot for cars and play dough. I embraced the hard conversations with my kids who missed home, and tried to provide an environment of joy and fun that my younger kids could thrive in. 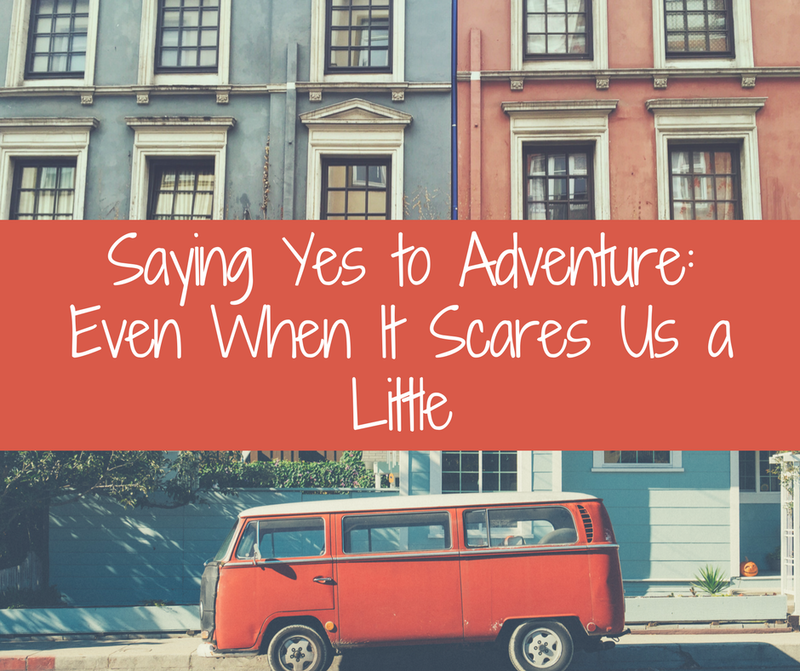 Find joy in a hectic adventure? Yes. Create fun in a motor home? Absolutely. It was the evening of our first night at an R.V. park that I felt like we were going to make it. Cooking tacos in the tiniest kitchen ever, over a little gas stove and chopping the fixings on a cutting board balancing on the armrest of the couch…I knew that as long as we had food and each other – all was well. My boys came in and out of the four-foot kitchen space like they usually would, and suddenly life felt as normal as it possibly could. and to surrender to what was ahead no matter where on earth (literally) we were living. We parked the motor home at a camp north of Seattle and ended up staying there and volunteering for three months as the job interviews progressed. Can I mention that it rained without ceasing for those entire three months? God bless all mothers whose homes are decorated with mountains of rain boots year round. Living out adventure with kids in tow that were in every possible stage of life, stretched my faith and my sanity! The journey forced me to believe more than ever in a God who not only provides – but desires us to live a rich life, full of wilderness exploring and everyday celebrating. In the mornings I would use my stealth skills to not wake the baby tucked up next to me, while reaching for the button on the coffee pot hanging under the microwave. Perching in the corner as quietly as possible, I prayed I wouldn’t disturb the other six. Slowly, I sipped the warmth that would gear me up for yet another day. Boots were pulled on, hoods secured, and buckets to collect all the found treasures were gathered and brought along for the day. We were on a mighty mission to investigate and collect all the bugs, slugs, worms, leaves, sticks, and rocks in our new surroundings. Logs were jumped over while eagles soared overhead and we grew to love our stunning playground. We became actual Olympians in mud puddle jumping. There were clear streams and wooded trails with canopies of cedar trees that served as the perfect backdrop for a photo shoots just because. As the weeks passed by, I realized that this adventure was going just fine – as long as I held on to faith. Cooking brownies helped too, and so did lighting camp fires to welcome the night. Seeking adventure in hard seasons takes work. Choosing to live fully and in the day-to-day, doesn’t have to wait for the perfect destination. It can surely happen along the way. We landed the job near Seattle and moved into a home on the river, where everyday adventure lives on. We made it - and so can you.